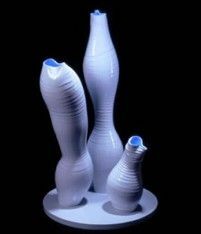 This unusual light is made up of three irregular grooved vertical cylinders blowing PVC resting on a white plate. Two are white, and the tallest of the three is black. The entire piece has a very high gloss.